What does the Supernanny do in times of trouble? She makes a schedule, that’s what she does. Then she organizes. And after that, she organizes her schedule. Even for us regular, non-super parents, a little planning and organization can go a long way, especially during the hectic back-to-school season. Routines are meant to be broken, right? Sure, in a couple of months when your whole family has this school thing figured out. But for now, make a routine and stick to it. 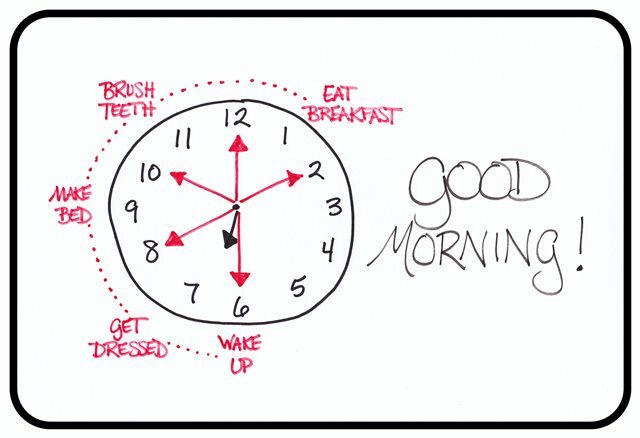 Tip #1: Create a morning routine that is broken down by time. Each person—kid and adult—should know when they are supposed to wake up, what jobs they are in charge of in the morning, and when they need to show up for breakfast. You may find that this is no problem for your kids. Or you may find that one or more of your children find this particularly difficult. I know in my house my kids vary widely in how well they stay on task. Yelling every morning got to be a real drag, so I eventually decided just to wake the slow ones up a lot earlier. Tip #2: Use personalized discipline to make sure kids stick to their morning routine. Think of what motivates your child when you are dreaming up how you’re going to enforce this routine. My husband is the king of concocting original discipline techniques, and he always asks himself what the child really, truly wants. Then, you can either offer this if they do well or take it away if they don’t. In my house, my kids have favorite stuffed animals that they would take with them everywhere if we let them. So our rule is, if they are slow getting ready, and therefore don’t have enough time to finish their breakfast, then they can’t take their favorite stuffed animal in the car with them to school. It’s not a big thing, but for our kids, it works. You just need to find what works for yours. Tip #3: Don’t forget the nighttime prep. I know, after you’ve finished the evening’s dishes, the last thing you want to do is think about the next day. Who knows, maybe you won’t need to implement this tip. But last year, when I had two kids in school and one in preschool, I finally caved in and started making the lunches the night before. It made my mornings a zillion times easier. Along those same lines, have your kids set out their backpacks and the next day’s clothes at night before you tuck them in. That way, they’re less likely to forget their homework, recorder, etc., and you can intervene in the event of crazy outfit combos before anyone gets dressed. The papers—they just keep coming. Letters from the teacher, the principal, the PTA. Classroom rules, school rules, district rules. Sign-up forms for the school directory, for the class picture, for the first fundraiser. And that’s even before the homework starts coming home. Tip #4: Find a home for all those papers. Most of the papers just need some attention—to add a signature, to take note of a date, to save a phone number—before heading back to school or being dumped in the recycle bin. But the ones you want to hold on to need a home. Without one, they will most certainly overwhelm your life (or at least your kitchen). This can be as simple as a folder marked “SCHOOL.” Or if you have multiple children, an expanding file with a section for each child might better suit your needs. Tip #5: Technology is your friend. A little upfront work at the start of the school year will make you happy all year long. Create contacts for all your children’s teachers (and one for the school itself), and include any phone numbers, email addresses, and websites they provide. I also record information about their free periods or other good times to contact them in the contact’s notes field. Aida offers this great tip for large families: If you use Google Calendar, you might want to create a separate calendar for each child. (Look to the left of your screen, select “My Calendar” and then “Create New Calendar.”) Google Calendar lets you choose a unique color for each calendar you create. That way, when you look at your “master calendar” (which lets you see all your calendars at once—for example, you might have calendars for Family, Meals, Kid 1, Kid 2), you can see at a glance who’s going where and when. Too much talk of structure and I start to get the urge to bolt. But without it, the commotion of a new school year can overwhelm even the calmest parent. Better to create a few systems up front to keep your life running smoothly the whole year through. Do you have any systems or tips that keep your household running smoothly? Please share below—we could all use the extra help!